For an introduction on the 1.4 features read this post. Changeling Sequencer is a simple tool for people that like to create music, but don’t have the discipline or time for studying music theory or years of piano improvisation practice. Changeling has its foundation in musical improvisation theory. Although Changeling ‘knows’ about theory, this app does not generate pieces of music. It is designed for you to remain in full creative control. With this diatonic sequencer all notes produced are ‘of the scale’. This means recorded musical notes remain relative to each other, and can thus be changed in various ways during playback. A convenient effect of this is that the music you play will always sound in tune. On a traditional MIDI keyboard each key that you press produces a note that you can record. Press the same key twice, and you will hear the same note twice. With the Changeling keyboard each key you press produces a scale degree that you can record. In Changeling press the same key twice and you will not neccesarily hear the same note twice. This is because if you change the scale in between key presses a different musical note will be the result! Diatonic harmony means: chords built from a particular scale. The most common way is to stack 3rds from each degree of the scale; by skipping every other note. On a traditional keyboard this means that you must learn for each chord within a scale what combination of white and black keys to press together. For the Changeling keyboard this means: just press every other key! To make things even easier, you can use just one finger to press the first note of the chord (chord function), Changeling can stack the remaining notes for you. This introduction should make it clear why Changeling is called the flexible diatonic chord sequencer. I hope you will have a lot of fun and inspiration while creating great music with Changeling! Where a traditional keyboard has twelve keys per octave changeling has seven: One for each scale degree. The first degree of the scale “the root key” has a darker color. All keys that are currently sounding are highlighted in real time to provide feedback. Velocity is influenced by the position where you hit the keys. Hitting low will produce a softer sound, hitting high will produce a louder sound. When you swipe your finger while touching a key, the keyboard will slide along. Move with more than one finger in the same direction, and the keyboard will follow the slowest finger. Keep one finger fixed or move your fingers in opposite directions, and the keyboard will block. When swiping with four fingers in the same direction this will trigger the IOS ‘switch application’ gesture. So make sure to disable gestures in the system settings if you find this inconvenient. You can toggle the sliding behaviour of the keyboard by touching the keyboard lock icon. Tap or swipe the keyboard scroll bar to quickly slide the keyboard to a different position. The sequence information display gives real time feedback about the active sequence. It is shaped like a circle since sequences in Changeling Sequencer are loops by design. In the center of the display you will find the current position of the sequence in musical time numerically represented as bars & beats. The white outer ring of the display also indicates the current position, in a more visual manner. All recorded musical events that you record to the sequence will appear as segments in the highlighted inner ring. The color of the recorded musical events that you see will reflect the color of the active track. You will only see musical events of the active track displayed. Right underneath the numerical time indicator is the note/chord indicator. This tells you the names of the notes and chords that are currently sounding. You can find the title and active track number of the current sequence in the top-center of the main screen, right below the status bar. Tap or swipe the ribbons during recording or playback and listen to the changes. The Key ribbon is on the left, it consists of all musical note names C through B. Tap or swipe to change the current root key of the scale. This effectively modulates (transposes by scale degree) the sequence. By default all tracks in a sequence share the same key and scale. You can change this behavior by locking the key or scale of a track. Press and hold the ribbons to lock the selected step for the active track. It will be marked by a ‘*’. Press and hold again to unlock. The chord synthesizer can be manipulated by turning the three dials. Just drag the orbiting white dot around the dial to change the parameter values. You can also tap the around the edge of the dial for quick value changes. You can use different settings for each track. LHDBL: left hand doubling. The notes are stacked one octave below the pressed key. Doubles the root note of the chord. RHDBL: right hand doubling. The notes are stacked on octave above the pressed key. Doubles the root note of the chord. DBL: split keyboard version of the two previous voicings. The split lies in the fourth octave. RHSHL: right hand shell voicing. Root in the right hand, 3rd and 7th in the left hand (counted from one octave below the root). LHSHL: left hand shell voicing. Root in the left hand. SHL: split keyboard version of the two previous voicings. The split lies in the fourth octave. SMOOTH: selects the inversion that is closest to the previous chord. JUMPY: selects the inversion that is furthest from the previous chord. The arpeggiator is used for creating arpeggios / broken chords, that is chords played one note at a time. It is operated the same way as the chord synthesizer. Just drag the orbiting white dots around or tap the edge of the dials. The dial labelled ‘delay’ adjusts the time time between notes in the arpeggio. The value represents the number of ticks (bar/64). You may select a value between two and sixtyfour. play/pause, NB. Pressing play in idle mode will start the recording of all produced MIDI notes to the export file. undo, Each time you switch between record an playback mode, a new version is added to the undo stack. The undo stack will reset when you change sequences. Use the sound switch to toggle the metronome click sound. Use the count in switch to toggle the inclusion of a bar of time before the recording actually starts. Use the BPM slider to adjust the tempo of the sequencer to any value between 60 and 225. Use the quantize slider to adjust the quantization during the recording of patterns. You cannot change quantization of notes after the notes have been recorded. Tap on the ‘clone’ button to duplicate a sequence. The duplicate will have an apostrophe appended to the original name. “Midi Source” lets you select any connected external Core-Midi device (through camera connection kit or network) such as a master keyboard or drum computer. “Input Mode” lets you select beween Gated and Diatonic input modes. See the Midi input section for details. “Mod. Interval” lets you specify the relative distance between root notes when cycling in “Diatonic mode”. Tap the “Zone start” arrow to start ‘learning’ the beginning of the mapping zone by pressing the preferred key on your connected external midi controller. This key will be assigned to the first trigger. The next 15 midi values are assigned to the rest of them. Tap any of the parameter arrows to start ‘learning’ the Control Change id of a physical knob or slider on your connected external midi controller. Switch between internal sound and midi mode. Press the arrow to change the active soundfont. All “sf2” files that are opened with Changeling Sequencer (via Dropbox or email attachment) should appear in the SoundFonts list. Be aware that the internal sound (ausampler instance) is still monophonic. Slide the volume slider to change the overall volume of the internal sound. Tap on one of the three icons to switch between the keyboard, trigger & tracks mode. 1. The 16 pads allow you to quickly trigger and/or queue a sequence. 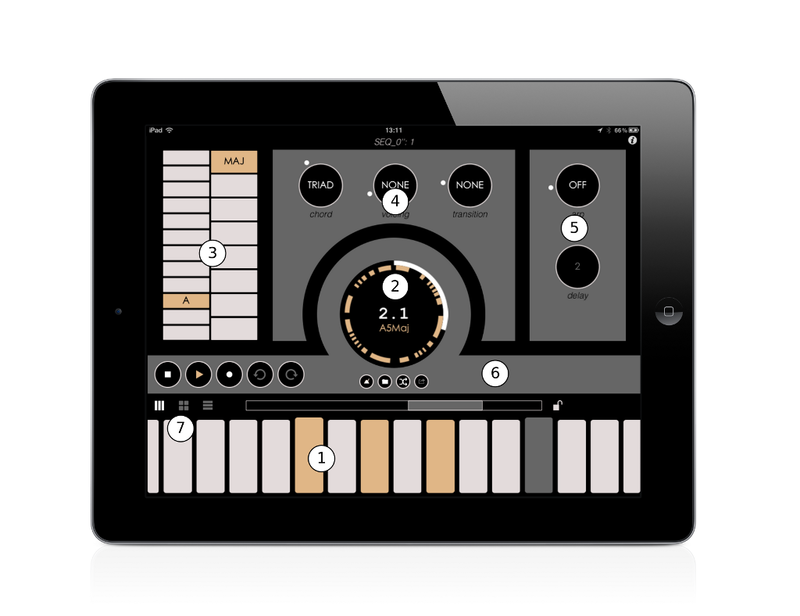 Assign the ‘current’ sequence to one of the pads by using a longpress gesture on an empty pad. (Use the sequence browser to choose another sequence as the current sequence, and assign that to another pad). 2. The ‘next’ queue shows which sequences are up for playing next. Toggle the queue loop by tapping the loop icon on the right side of the queue. When loop mode is off, sequences are removed from the queue after they have been played. When loop mode is on, sequences are moved to the end of the queue after they have been played. by assigning a root midi channel that is different from the main channel. Next to each track number is an activity indicator, that displays the current midi velocity for the notes that are playing in the track. When a track is not sounding due to the mute/solo settings, a grey ‘M’ is displayed in the center of the sequence information display, regardless of what mode you are in. All midi notes that are not part of the current scale are discarded. This can be used for importing existing midi sequences into a pattern from an external midi sequencer or player. When the Trigger screen is active in Changeling Sequencer, you may use your connected external keyboard or pad controller to trigger patterns. The default zone mapping starts at midi note 48. Triggers are added to the queue unless the velocity is larger than 100, then they will change the pattern immediately. So gently press to add a pattern to the queue, hit a key hard to trigger a pattern asap.